Do you have acne? That must be hard. But wait - there is still hope. 1. Eat more fresh fruits, vegetables, nuts and seeds. You can easily create juices and smoothies using ripe fruit or consume one salad daily, even as just a side dish. You can also pop in nuts and dried fruits in between meals. Brazil nuts have selenium while pumpkin seeds contain zinc - both these minerals are lacking in people with acne. So take in lots of these two. 2. Try to drink at least two liters of still mineral water daily. When the skin is dehydrated, dead skin cells remain on the skin which may block pores and promote acne. 3. If you have been prescribed antibiotics to control your acne, remember that antibiotics destroy all kinds of bacteria in your digestive tract - even good bacteria. Without good bacteria, you will have poor digestion, constipation, and be less able to absorb essential vitamins, minerals and nutrients. This, in turn, may lead to increased acne production since your body cannot expel waste effectively. Toxins pass through your skin instead. To prevent this from occurring, replace the good bacteria in your digestive tract with a good quality probiotic. o Maca - This is a powdered root vegetable from Peru that balances and stabilizes the systems of your body while normalizing hormones. Maca also has a lot of essential amino acids, phytochemicals, fatty acids, and minerals such as iodine, silica, potassium, iron, magnesium and calcium. o Manuka honey - This one possesses strong antibiotic, antiviral and antiseptic elements. It is great for the skin, as well as for digestive disorders. 5. Rely only on natural skin-care products. Many skin-care products on supermarket shelves have chemicals which can worsen your acne. Too many chemicals can strip your skin of its natural oils, meaning the skin will overproduce oil to compensate - thus blocking your pores and causing more acne to show up. Use only products with natural ingredients or try to use fewer products to allow your skin to naturally heal. Should you wear makeup, use formulas that are listed as non-acnegenic or non-comedogenic. o Tea tree oil body wash - This product can be used for the entire body, including the face. o Tea tree oil - This product has antiseptic, antiviral and antibacterial functions. It is remarkable for use by acne sufferers. Use a cotton bud to apply this product to the acne blemishes. o Neem soap - This product is very good for acne victims due to its antiparasitic, anti-inflammatory, anti-fungal, anti-viral and antibacterial properties. It also calms and soothes irritated skin. o Exercise - Moderate exercise such as Yoga and Tai Chi improve skin blood flow and support the healing process. It also boosts the condition of your internal organs which allows them to eliminate waste more effectively. o Try relaxation techniques including meditation and breathing exercises. 7. Cut down on your consumption of sugar and refined carbohydrates. Recent research has shown that eating these foods triggers a process which leads to a production of too many male hormones. In turn, the skin is moved to excrete huge amounts of sebum which fosters the increase in skin bacteria - that triggers acne. 8. 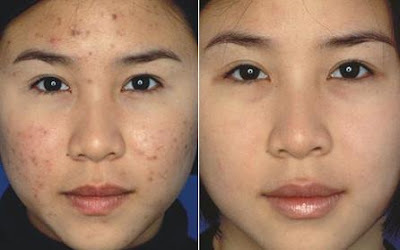 Lessen your consumption of caffeine because it hikes the level of stress hormones in the body, thus making acne worse. 9. Cut down on dairy and red meat products because these are difficult to digest and raise acid levels in the body. As you try to digest huge amounts of animal protein in your internal organs, your body cannot eliminate waste products well and these will be released through the skin - causing acne. In addition, dairy and red meat have huge amounts of hormones. These raise the hormone levels in the body and trigger even more acne. Furthermore, symptoms of intolerance to dairy products can crop up as acne. 10. Get plenty of sunshine and fresh air. Sunshine triggers the production of Vitamin D which is essential to having healthy skin. Fresh air and sunshine will cut down on your stress levels and course oxygen through the skin. Learn to tell the amount of sunshine you need every day though, it does not help to get burnt in the sun.